At Budget Blinds of Harrisburg, Elizabethtown, Carlisle, we're your local neighborhood experts that truly understand your needs. We're in your neighborhood, we know the local Harrisburg, Elizabethtown, Carlisle weather and community, and we’re backed by the #1 provider of blinds, shades, and drapes in North America. Over 25 years of customer satisfaction gives you peace of mind that only comes with choosing the proven leader. We bring the showroom to you in Harrisburg, Elizabethtown, Carlisle. We expertly measure your space, install beautiful window treatments, and back it up with the best warranty in the business so you can sit back and relax in the beautiful, Harrisburg, Elizabethtown, Carlisle weather and sunshine. We serve to give you the best in window treatments, so you can rest easy knowing your space will be beautified and optimized with window treatments that fit your individual needs. Ready for feature-rich, state-of-the-art window fashions that stand the test of time? 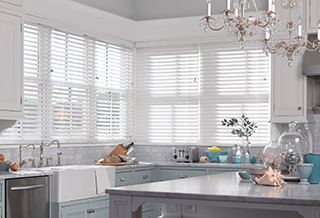 Then welcome Budget Blinds serving the Harrisburg, Hershey & Carlisle Areas, your one-stop resource for blinds, shades, shutters, and drapery that make your house the home you’ve always dreamed of. It’s easy to see why Budget Blinds serving the Harrisburg, Hershey & Carlisle Areas is backed by the #1 provider of custom window coverings in North America. Our sumptuous selection of fashion-forward window treatments, combined with our unique, personalized approach to custom design ensure you’ll have years of “uber” style and windows that smile. And to make the design process easy and convenient, we’ll even bring our gallery of custom window fashions to you, in the comfort of your own home. Plus, as volunteers to the Harrisburg Humane Society and Homes for our Troops, like you, we’re active supporters of our community. Last week we had a large order fulfilled and installed by Budget Blinds for our home. The installer was Nick Herb and he did a fantastic job from start to finish—arrived on time, was neat and professional, organized, quiet in his work, finished on time, cleaned up everything in short order, and all blinds look and operate just as we expected. He is a credit to your company! I just wanted to express our satisfaction to you for the product and to also put in a good word for Nick. Blinds and window treatments were competitively priced and arrived as promised. Installation was done with care and attention to detail. I was very impressed! Very professional from the front end staff, Beth, to installer Nick. It was a great experience and would definitely recommend them as well as order again.